Our mission is to promote the sport of darts worldwide. We are actively involved in all aspects of darts publicity, including the sponsorship of darts tournaments, leagues and players. We also arrange promotional tours involving the darts legend and 5 times World Champion, Eric Bristow, World Masters Champion, Mark "Flash" Dudbridge and the world’s greatest exhibition player, Wayne "Hawaii 501" Mardle. Working in partnership with our dedicated team of sports trade distributors we are constantly looking at new ways to promote the game, develop new players and increase the market for our fun, entertaining and inexpensive sport. In short, we love darts! 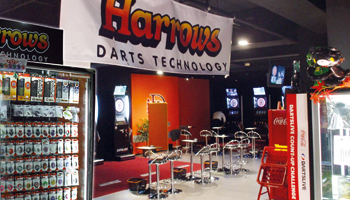 The Harrows Darts Cup in Japan is the world’s biggest darts tour. The D.J.O. organised series of 20 tournaments gives 50,000 different players a chance to win the Harrows Darts Cup in their city. Regional winners go through to the Grand Final at the Tokyo Big Site exhibition centre. This unique promotional initiative confirms our position as market leaders in Japan in particular and the Far East in general. 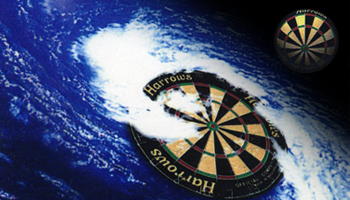 Players in the Orient and indeed worldwide rely on Harrows Darts Technology for continued precision performance. Our unique partnership with Taito Corperation in Japan sees us linking up with this entertainment industry giant to promote at the biggest darts stadiums in the world. 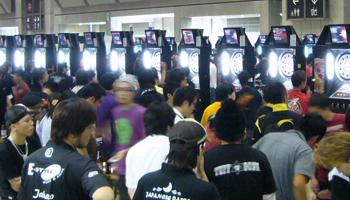 Situated in Ikebukuro and Shibuya districts of Tokyo, each stadium has over 40 state of the art softip dart machines. These superb entertainment zones are perfect for brand building, consumer product sampling and general Harrows promotion. Since 2001 we have been the official equipment sponsors of the Barbados Darts Festival. This fantastic event brings together darts players of all standards, from a host of different countries. 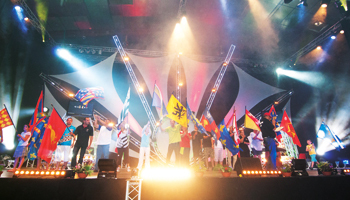 11 nations were represented at the most recent Festival, including teams from Austria and Guyana. 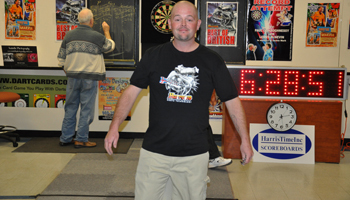 Participants all share a common love of the game and enjoy meeting new friends in darts. The festival offers a mixture of competitive darts plus all the entertainment the Caribbean has to offer, which makes for a unique holiday cocktail! Every year the Festival is hosted by a pro darts player. The incumbent is currently that unique entertainer, Wayne "Hawaii 501" Mardle. Before Wayne, Eric Bristow was Master of Ceremonies. This year’s event was marked by the inaugural Harrows Darts Mixed Nations Doubles tournament. In Continental Europe we have major distribution across every member state. One of the keys to our success has been aggressive and professional promotion in every territory. A recently concluded deal sees us as the title sponsor, for the next 5 years, of darts tournaments throughout the Czech Republic. The inaugural Transylvanian Darts Cup was recently held in Romania, where our boards were the official equipment of the event. Over in Western Europe we have been long term equipment partners of the France Darts National Chamionships and the affiliate international event, La Prestige. This superb week long series of softip tournaments in La Rochelle brings together teams from around France for the national event and from all across the globe for the international tournament. A total of 7000 players participate in this darting extravaganza! 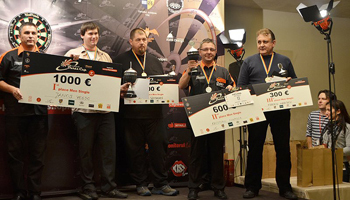 We have always been active on the European softip darts scene. This is no better reflected than in our long term assosciation with Bullshooter Europe leagues and tournaments. The recent 16th European Championships, which were followed by the 23rd Spanish nationals, saw the Spanish team playing in Harrows branded clothing. North America has always been a strong market for us. We have the Americans to thank for the invention of softip darts, the version of the sport that has generated the most new players in the past 25 years. Our regular attendance at the Supershow in, variously, Atlanta, Las Vegas and Orlando helped to increase our brand profile in this key market. North of the border we were excited to be involved in the setting of the Guinness World Record for marathon darts playing. Lenny McNevin and Paul O'Shaughnessy from Toronto played non-stop for an unbelievable 36 hours, 10 minutes and 10 seconds! Meanwhile over in Moscow we have been active on the darts scene for many years. 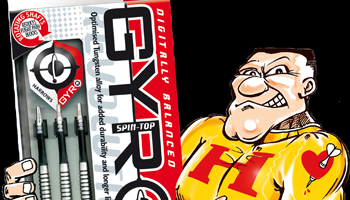 Our most recent activity saw us getting behind the promotion of softip darts in the country which had previously predominantly played the steel tip version. The Harrows Russian Masters, which was held in St. Petersburg, was a huge success with players travelling from right across this vast country to compete in a truly amazing tournament. As we move down to the sub continent we are proud to be equipment partners of the All India Darts Association. This government backed organistation has been actively promoting steel tip darts across the nation via its 16 affiliated state organisations. Traditional steel tip darts is clearly a numbers based game and as a result, A.I.D.A. 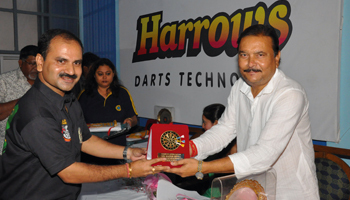 has been successful in introducing darts to the curriculum of many schools and colleges. Back to the Far East and we are associate sponsors of the IDF World Cup in Shanghai. This fantastic softip event featured teams from all corners of the globe and attracted extensive TV coverage. Team Thailand was resplendent in its Harrows shirts. Back in Tokyo. A high proportion of players in the Far East are young females. As a result we have created a wave of niche products for this market sector which have been a huge success. As you can see we have achieved a vast amount in promoting our sport and our brand in all corners of the globe. How have we done this? In partnership with our network of distributors around the world and by employing a lot of patience and hard work! However, none of this would have been possible without the support of our own “in-house” Superhero. Forget Superman, Batman and Spiderman, if there is a tough job to be done anywhere in the world it only takes one call and our very own darts legend will come to the rescue. Yes, meet Harrowsman! Astronomers worldwide have been amazed by the sudden appearance in the upper atmosphere of an inflatable Harrows dartboard. The mystery has, however, been solved following a News Release received from Planet Harrows. Intergalactic Superhero Harrowsman stated: "From my position here in space I have witnessed the increasing size of the hole in the earth’s ozone layer. I have been alarmed by the upheavals it has caused to earth’s eco-systems, i.e. extreme weather conditions, flash floods, searing heat waves etc. I therefore decided to do something about it and have plugged the hole with an ultra lightweight inflatable Harrows dartboard". Proof of Harrowsman’s handiwork can be seen in a NASA satellite image in which the hole is seen to be filled. Clearly in view on the horizon is the nerve centre of Cosmic Catastrophe Control – Planet Harrows. When asked where he got the energy for this amazing feat Harrowsman replied, "This is everyday work for me, as all I have to do is charge myself up in the morning with a bar of Tungstenite and I’m off solving the world's problems in a flash. My motto is "GET ENERGISED . . . GET HARROWS!"